Perfect for a spring wedding, but beautiful at any time of the year, this bouquet of mixed tulips is simple yet incredibly elegant. 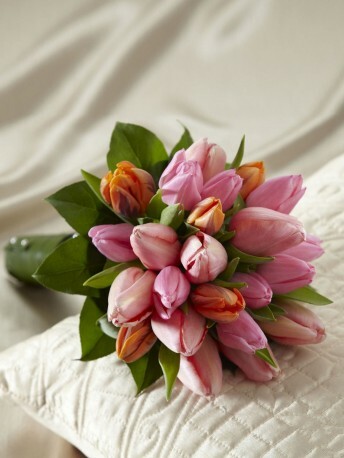 Salmon pink tulips are brought together with fuchsia pink and bi-coloured orange tulips and tied together with fresh ti leaves at the stems, accented with silver pixie pearl pins for an exquisite look. Approx. 12"H x 9"W.